Ryan and I saw our midwife Tina yesterday for my 8-week appointment (technically 7 weeks, 6 days - close enough). She was unable to hear the heartbeat with the doppler and was a little surprised when I asked for an internal ultrasound just to verify that all was well in there. I know the midwives are used to getting patients who want the LEAST tests, the LEAST monitoring, and normally that's me, but I couldn't help myself. There was a huge part of me that wouldn't believe everything was OK until I saw that little heart beating. So she got Dr. Karen, one of the OBs, to come give me an ultrasound. And as we all watched, there on the monitor was a little beating heart. So tiny. So perfect. 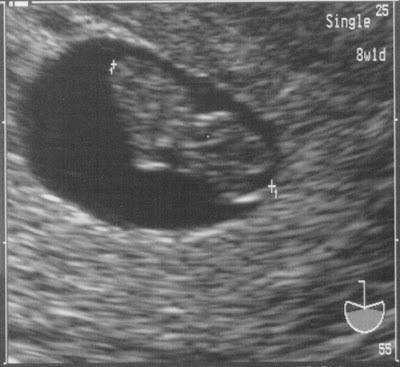 The little peanut is in between the two plus (+) signs. Now I believe it! Lily's really going to be a big sister.